I got a lot of flack for my review of “Peter Rabbit.” Many people thought my fellow critics and I were too cruel in our reviews of the film. What it boiled down to was that the film simply lacked the whimsy and heart of the books. 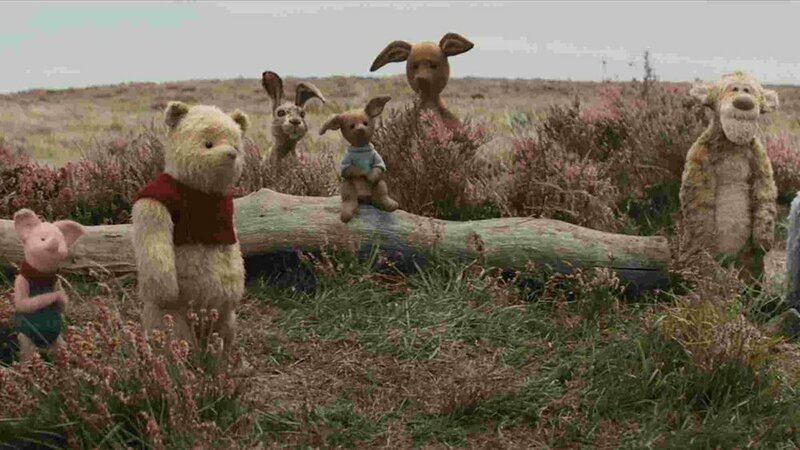 The same cannot be said for this weeks film “Christopher Robin." Director Mark Forster examines these classic characters in a more adult setting, all the while maintaining the willy-nilly-sillyness that children enjoy. Those of my generation have become very reliant on nostalgia of late when it comes to popular culture; whether it's television, films, or even music (Bruno Mars is a crooner of the Sammie Davies Jr. variety and we all know it.) Yet, “Christopher Robin” shifts our attention towards something more important. Let’s find out what that is shall we? “Christopher Robin” stars Ewan McGregor as the titular 100 Acre Woods explorer; now all grown up. After surviving the harsh reality that is war, Christopher finds himself trapped job that takes more than it gives; especially when it comes to his family (Hayley Atwell and Bronte Carmichael). When Christopher’s boss (Mark Gatiss) tells him that he must set aside some much needed vacation time to work, his family fears that they are, at last, eclipsed by his obligations. Then, one day, a childhood friend comes to seek his help: Winnie the Pooh. Pooh's friends have mysteriously vanished and he asks Christopher Robin to return to the 100 Acre Wood with him to find them. But what Christopher finds there might be more rewarding (Hint: its not honey). This film is delightful. It’s not your typical Disney remake, and its for that precise reason that it is my favorite of the animated classic remakes thus far. It does have some flaws, though you are able to look past them with relative ease. Director Mark Forster crafts a brilliant story that gives you just the right amount of everything. We never get too much of the animated characters and we never get too much of the real world turmoil. Forster does what he does best. He shows use a new take on a story we love and allows us to appreciate it more. Forster acoomplished such a feat with “Finding Neverland” and tried but failed to do the same with the James Bond film “Quantum of Solace.” Forster’s niche area is the 1920’s/1930’s. He really knows how to capture that time period beautifully. We all know McGregor is a fantastic underrated actor. In the 90’s and early 00’s young boys looked up to him as Obi Wan Kenobi from the Star Wars while every girl I knew had a crush on him as Christian; the sensitive romantic writer from “Moulin Rouge!” McGregor has a charisma to him that is just so darn likable. There are moments that you don’t want to like Christopher Robin, but McGregor is always able to win you back. I wasn’t sure what to think about a “Christopher Robin” movie. I found myself wondering who they would cast. Would it work? Then I heard Ewan McGregor was chosen and I was on board. He is a natural fit for this role, and one of the two main reasons to see the film. Jim Cummings’ performance as Tigger and, of course, as Winnie the Pooh will always melt the heart into a puddle of honey. Cummings has been a voice actor in Hollywood for many years and he’s been the voice of Winnie the pooh for almost thirty of them. Yet every time he plays this silly old bear, he adds a new layer. I know I must sound crazy talking about the depth of Winnie the Pooh, but it’s true. There’s a moment Pooh and Christopher Robin have that will bring you to tears, and that’s solely because of Cummings' performance. I don’t know if young children will understand some of the more serious elements of the film, but this is a fantastic film for both children and parents to see. “Christopher Robin” is full of heart and has a great message of looking at the world through a different lens. Although it is lacking in flashy special effects, this film will win you over. This is a great film for everyone. Old and young.